With over 2.2 billion active accounts, Facebook is the world’s largest social network. However, tricky ever-changing algorithms can make it difficult to reach people on the sprawling network. Contests and competitions can change that, by sparking excitement about your brand and putting it in front of people who may otherwise never see you, because they are built-for-sharing and virality. To keep your Facebook Page compliant, you need to make sure that you adhere to all of Facebook’s competition rules. Go over this list before you launch your next contest to ensure that you get the exposure you want without risking your account. Make it clear that there is no purchase necessary. Tell entrants that making a purchase does not increase their chances of winning. Tell entrants when the contest begins, ends and how long it will run. 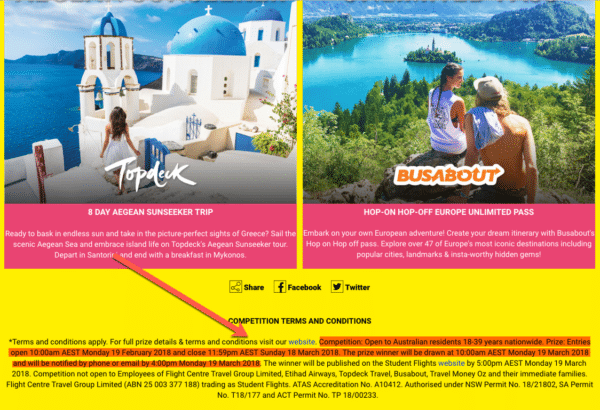 An example of a contest that clearly states the start and end date. Tell when and how a winner will be chosen by spelling out the judging criteria for the contest. Tell who is running or administering the competition. 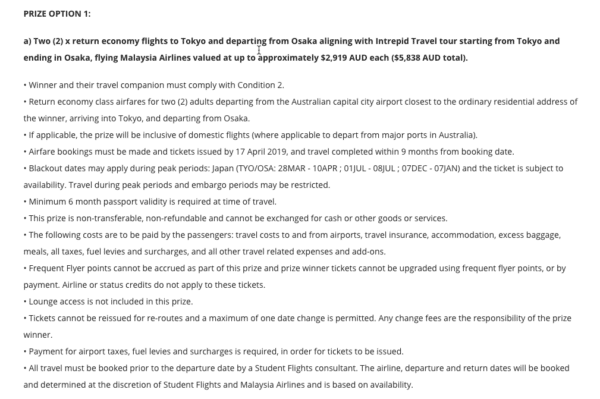 Contest terms that outline the prizes in detail. Include a release that allows you to use any user-generated content that is needed for the contest, as well as a release for any publicity rights. State that the competition is void where prohibited. For more information, check out our Facebook and Instagram Contest Rules Template. When running a contest or promotion on Facebook, you need to acknowledge that it is not endorsed, sponsored or administered by Facebook, nor is Facebook associated with your contest. Additionally, there must be a statement that releases Facebook from any responsibility to entrants or participants. It’s important to understand which kind of contests are allowed on Facebook and which ones are not. Sweepstakes and drawings, where someone only needs to enter to win and winners are chosen by chance, are permitted. Contests where entries are judged and the sponsor or their agents choose a winner are also allowed. However, lotteries, where someone must buy a ticket to win, are not. Expanding on the rule above, Facebook expressly prohibits contests from requiring “consideration” to enter. Consideration, legally speaking, means having to exchange something of value for your entry. It is important to realize that, in some places, a person’s identifying information, such as a name, address and phone number, are legally consideration. Make sure that you understand the laws of the location where your contest will be available. We’ve all seen Facebook contests where you must share a post in order to win. What many will be surprised to learn is that these sorts of contests are expressly prohibited by Facebook’s rules. Facebook does not allow you to require actions on their platform in exchange for entries. This means that you can’t ask for likes or shares on Facebook as a means of entering. However, you can have a contest that leads participants off Facebook and asks for actions there. Contest software that has referral features that allow people to gain extra entries is permissible. You also cannot require that people tag friends in order to enter. A better idea is to create a contest that people want to share because they are excited about the content or the prizes. If you have accidentally created a personal profile for your business instead of an official Facebook Page, make sure you straighten this out before running your contest. According to Facebook’s rules, you can only run a contest from a Facebook Page, Group, Event or App. Contests on Personal Timelines are not permitted. 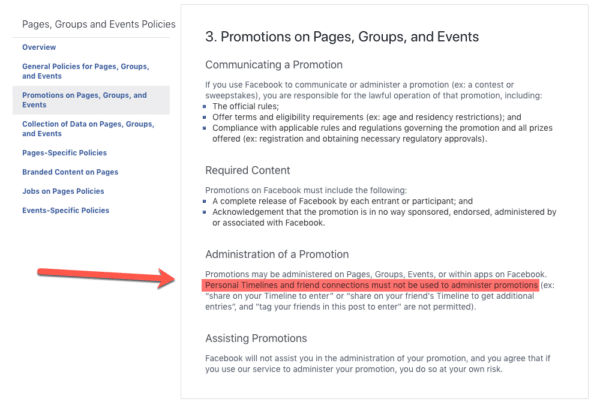 Facebook’s Promotions rules with regards to Personal Profiles. If you are running a competition where entrants submit photos, video or other content, make sure that you have a place where they can acknowledge that they agree to you using it. User-generated content (UGC) can be an extremely valuable asset for a business. It can generate interest in a contest and help raise awareness of your brand. Entries from previous contests can be used in promotions going forward if you have attained permission to do so. But, you can only use these if you have the permission from the people who enter your contest. Additionally, if you are going to announce who the winner is, you need to get publicity rights from everyone who enters your contest. Since this should be in your contest rules, anyone who clicks “agree” will have given permission. 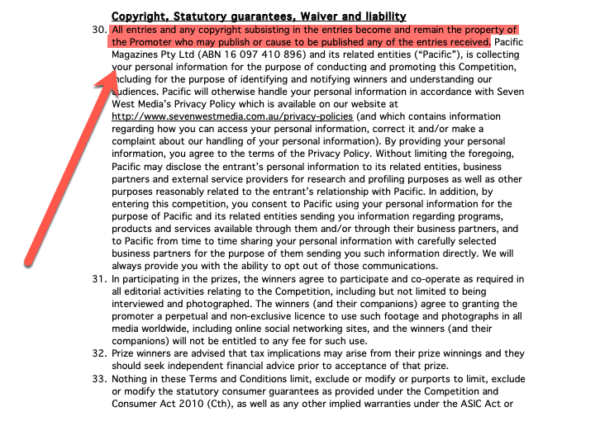 Contest Terms outlining the rights to re-use content. The last rule spelled out in Facebook’s contest and promotions rules is that they will not administer your contest or assist in it. Additionally, any Page running a promotion on Facebook does so at their own risk. What this means is that, if you run afoul of rules or laws for running your contest, Facebook is not to be held liable. Adhering carefully to the rules when running a Facebook contest takes a bit of extra time and consideration. It can mean jumping through a few more hoops than just posting some images and a contest on your Page. However, by making sure that you are in line with every one of Facebook’s competition rules, you can ensure that your contest runs smoothly. Watching the rules carefully now means less chance that your content will be deleted or that your page will be suspended or even permanently banned. Keeping in line with the rules removes these risks and allows you to enjoy the benefit of good will, greater exposure and better awareness of your brand.